Generics - Is the Commodity Business Model Sustainable? Recent diversification behaviour amongst generic companies raises questions as to whether they believe commodity generics have a future. Whilst strong drivers for generics still apply in both developed and emerging countries, diversification strategies such as entering the speciality medicine market, developing biosimilars and breaking into the OTC sector, are increasingly common. The last two years have seen signifi cant changes in the OTC sector as companies restructure and consolidate. This year there has been the acquisition by Bayer of Merck & Co’s OTC business for $14bn, the 63.5%/36.5% joint venture between GSK and Novartis with combined sales of $10.9bn, the acquisition of the Chinese company Dihon by Bayer, and Reckitt Benckiser has bought the KY brands from J&J. 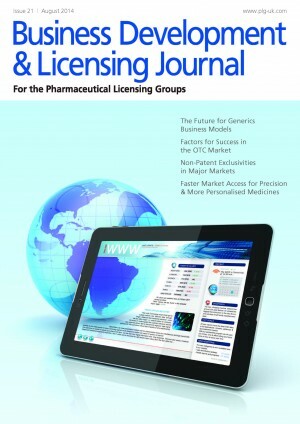 If you are in a position where your firm is to commercialise a niche drug in Europe, you might typically have considered two conventional options; to build up your own commercial platform or to make a deal with a large pharmaceutical company or multiple regional or territorial distribution partners. The first approach requires significant time and resources while the second leaves you locked without strategic options for your product and a sub-optimal financial return. The recent emergence of the European Partner Commercialisation Platform business model may offer a new alternative by providing commercial solutions customised for your product, superior financial returns, and a full range of strategic options for the future of your product. An additional benefit of a European Partner Commercialisation Platform approach is that it may speed up access to innovative niche medicinal products for patients across Europe. Patent protection is the mainstay of exclusivity for new pharmaceutical products. However, the 7-12 years necessary to bring a pharmaceutical product to market consume a substantial portion of the 20-year patent term, and some promising products may have limited or no patent protection available. Health authorities have therefore introduced several non-patent exclusivities unique to pharmaceuticals to encourage the development of products for children and rare diseases, and to compensate for regulatory delays. Digital technologies, along with advancements in data analytics, genomic and diagnostic technologies, and access to real-world patient data, are making “adaptive” fast-track access for precision and more personalised medicines a real possibility. For companies holding the rights to potential breakthrough drugs, these new, more interactive and flexible approval and reimbursement frameworks could create increased value earlier in the development phase. Big Pharma is facing a crisis. R&D productivity is going downhill and blockbuster products are falling off the patent cliff. Investors have little confidence in the future success of the companies as reflected in share prices underperforming compared to the market. This is the “half-empty” view of Big Pharma’s future. In contrast, John Ansell takes the “half-full” view in his book, Transforming Big Pharma. Welcome to the June Deal Watch, our monthly analysis of the top pharma deals. In line with our customary practice, this review focuses predominantly on those deals where financial terms are disclosed during June. So, as we move into the summer of 2014, what’s hot and happening in terms of deals this month?